Shopping through Waikiki Beach Walk – AdStreamz, Inc.
Waikiki Beach Walk, located off of Kalaukua Avenue on Lewers Street offers a wide variety of stores and restaurants for all ages. The store ranges from clothing stores to even locally-made Hawaiian products. The atmosphere is relaxing which gives off a leisure-shopping experience. During certain days of the week, they have different activities and entertainment around the grassy lawn on the first floor perfect to get into the Hawaiian culture! If you need a hat for the beach then head over to Truffaux to get the perfect style that matches you! Truffaux is a hat company that customizes hand woven straw hats to fit everyone! Truffaux at Waikiki Beach Walk is the only location in Hawaii. The store has it’s own style that draws people in as they walk by. They have so many different styles to choose from that it makes it hard to pick just one! Looking for some jewelry to match your seasonal styles? Na Pua Jewelers is a small jewelry store that carries Pandora on one half of their store and Hawaiian jewelry on the other. Pandora is what caught our attention as it was displayed on in the window. Pandora is a type of jewelry where each charm is bought separately to make bracelets the most customizable for every person. Not only do they sell the bracelets and charms but also rings to show off a girl’s elegance! Dainty, but stylish! Island Sole sets the fashion statement for your feet! This shoe store offers all types of shoe brands. Toms was our favorite out of the rest because they offered the most styles that could be worn for everyday attires or even special events. The workers are very friendly and offer the best assistance to fit the type of style you are looking for! If you are looking for something more specific like boots or shoes, there is also Island Sole Mate located across the street of Island Sole which specializes more in the brands Ugg & Olukai. Don’t forget to stop by Island Sole when in the area! Mahina is a Hawaii boutique that started off on Maui and now has expanded to the neighbor islands. Mahina is one of our favorite stores to shop at because they have so many different styles to choose from! We spent a little more time in there than expected and bought a few things to add to our wardrobe. Check out some of our favorite pieces we saw in the store! We thought ‘Ohana Island Style had such a unique concept! It isn’t just a store that sells local clothing and products, but they also have a studio in the back of their store used for hula and yoga classes! Something that really caught our eye was the Mau Mapu clothing line with the fun and creative graphics! The clothing line was inspired by a marathon runner who designs these tanks for active wear. Head up to the second level to see a little piece of Hawaii! 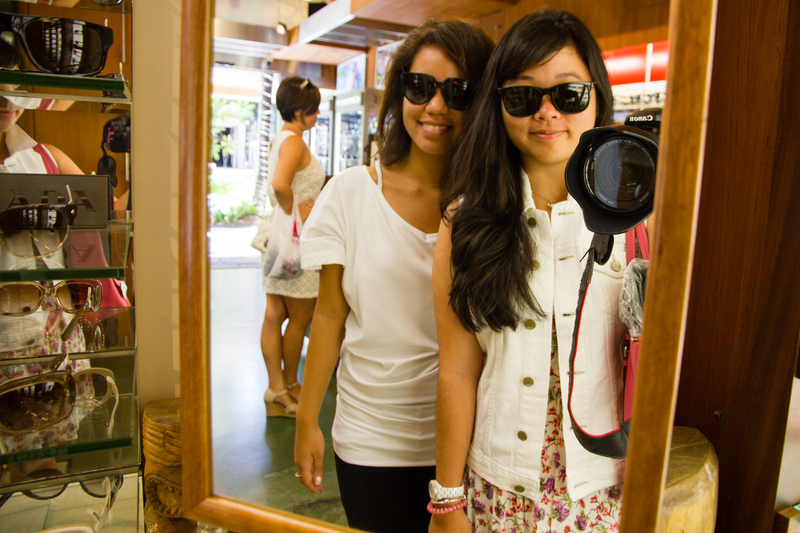 We had a lot of fun trying on cute glasses at Freaky Tiki Tropical Optical. Even if it’s a small store, they offer about 19 different brands including popular brands Ray Ban, Maui Gem, Oakley as well as designer brands like Coach, Juicy Couture, Gucci, and Prada. Glasses are placed in front of mirror walls on glass shelves for easy access of trying on different styles. After a long days of work, Yard House is the place to eat for lunch or dinner. The restaurant can hold a large capacity of people complimenting long rush hour waits. Street tacos are one of Yard House’s specialty entrees so we decided to try the Korean Grilled Pork Belly, Kalua Pork and Blackened Swordfish. Not only did it come with the tacos, the meal included delicious spanish rice and oven-baked beans toped with melted cheese to compliment the tacos very well. For dessert, we ordered the Baked Brownie with Vanilla Ice Cream. If you decide to order this, be aware that it does take at least 15 minutes to prepare and is also very large! Don’t be fooled by the picture, three of us shared one order and barely could finish it! Yard House is a restaurant recommended to eat and hang out with friends. 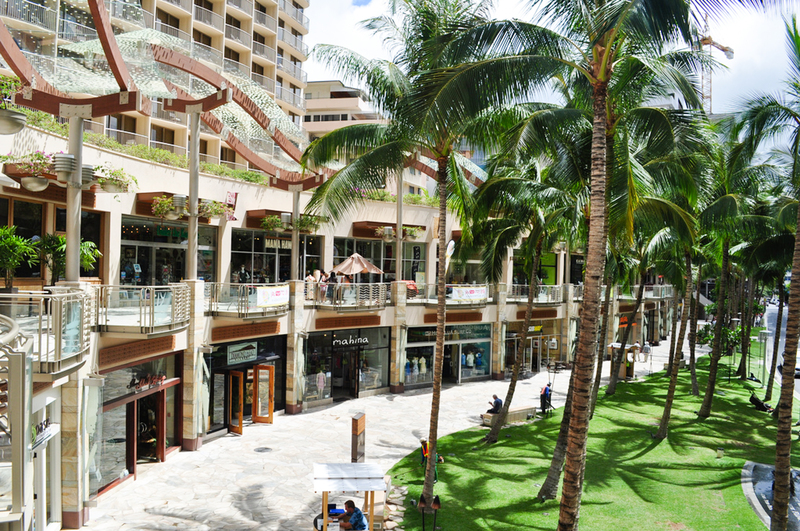 The next time you are in Waikiki, don’t forget to stop by and check out all of the amazing stores and attractions at the Waikiki Beach Walk next to Royal Hawaiian Shopping Center!